Providing overnight delivery of LCD projectors, laptops, video cameras and wirelss microphone systems. AVIVA Rental Systems carries mainly IBM laptop and Dell and HP desktop computers. AVIVA's current laptop inventory is comprised primarily of T-42, T-41 and T-40 IBM (now Lenovo) ThinkPad laptop computers. Light and fast with a bright screen, the reliable ThinkPad T-42 and T-41 are two of the best "thin-and-lights" on the market. 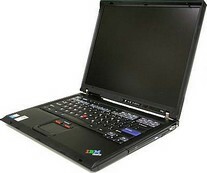 AVIVA Rentals also has some T-40 IBM laptops, quite close to the performance of the IBM T-42 and T-41. With an Intel Pentium M CPU, running at 1.7GHz, with 2MB of Level 2 cache coupled with 512MB of PC2700 DDR SDRAM the T-42 delivers the goods in a 60GB, 7,200rpm hard drive. Adequate for any applications you're likely to consider running on a notebook computer. Please note laptop selection is limited to availability, so please call as far in advance to reserve your preferred selection. Planning a training session for your company? AVIVA Rentals can deliver all the laptops you require to your training facility! AVIVA can ship laptops overnight anywhere in the continental United States! Call 877.564.9143. Authorized dealer for EIKI LCD Projectors, Da-Lite presentation products, Optima lighting, Gator AV cases, Milos Structural Systems and SunBrite's Outdoor TVs.